The Serial Console is a SolusVM feature that enables an SSH connection in case you misconfigure your firewall or stop ssh service, for example. Use the email and password you've entered during registration in VPSGet. Click "Services" > "My Services"
You will see your virtual private servers. Press "View Details" at the right of the server whose serial console you want to use. Press on "Console" > "Create Session". Session window should appear. Use the password shown in upper side of session window. Use the credentials you've got in ''Your Virtual Private Server details" email. If you can't find your credentials create a support ticket to resolve it. You will see your virtual private servers. Press "Manage" button at the right of the server whose serial console you want to use. Select "Serial Console" in a left side. When console is loaded press "View Connection Settings" to see login/password and enter the console. 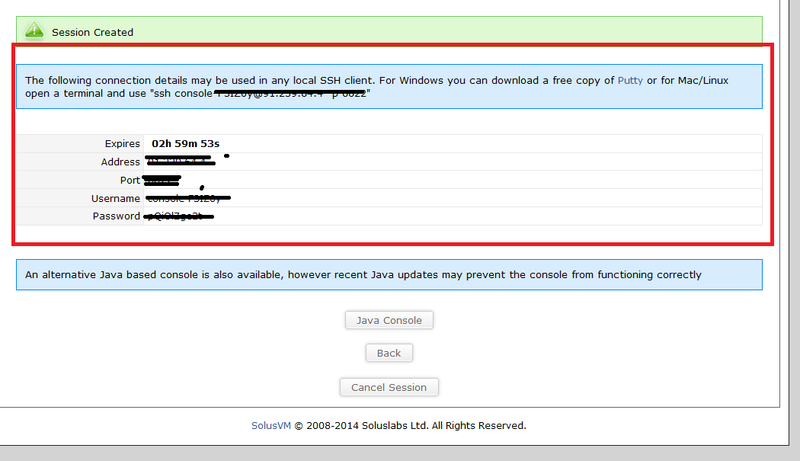 Once the session will be created you'll be able to access your VPS using any SSH client or using browser Java plugin.